Cellular response to ionizing radiation involves generation of a variety of reactive chemical species called free radicals which modify their function depending on the dose of exposure. It is found that response of cells to low doses and high doses of low linear energy transfer radiation is differential which is believed related to altered redox status of the exposed cells. In normal cells, metabolic process utilizes oxygen which contains an unpaired electron and exhibits free radical nature. Cellular metabolic processes produce many partially reduced oxygen radicals and molecules such as superoxide anions (. O2−), hydrogen peroxide (H2O2), hydroxyl radical (. OH), singlet oxygen (1 O2), peroxyl (ROO. ), and alkoxy (RO.) radicals which may initiate and propagate free radical chain reactions adversely affecting the cell function. These radical and molecular cellular products are commonly known as reactive oxygen species (ROS), some of which are known to be involved in many useful cellular functions. Evolutionary cellular processes have devised to restrict and control these species by multiple antioxidant defenses such as antioxidant compounds capable of inactivating radicals (e.g., ascorbate and alpha-tocopherol) and enzyme systems (e.g., superoxide dismutase [SOD], catalase, and peroxidases) that regulate the level of intracellular ROS. The production of ROS exceeding the ability of the organism to mount an antioxidant defense results in oxidative stress causing tissue damage producing diseases including cancer. Ionizing radiations and environmental chemical agents are known to generate ROS in cells producing numerous pathological conditions and diseases. It is important to note that cellular response to external stressors depends on the antioxidant status and adequate activation of mechanisms of signals required for cell survival. There is a tight control on normal ROS level and built-in endogenous antioxidant defense inside cells which regulates cellular functions and organ development. Maintenance of appropriate redox balance is critical for cell survival. Unlike low doses (<100 mSv), moderately high doses of ionizing radiation-induced ROS inside cells have potential to damage vital cellular constituents, thereby transforming normal cells to cancer cells., The oxidative stress-induced cell transformation is brought about by damage to cellular molecules such as DNA, lipids, proteins, carbohydrates, and other components.,, It is found that radiation generated excess ROS in cells if continues unrepaired for longer time, and endogenous defense becomes inadequate resulting in cellular injury and onset of many diseases ,, including induction of cancer.,,, The stressed cancer cells accumulate ROS, damage DNA resulting in gene mutation which initiates and promotes growth. More recent studies have shown that ROS promote tumor progression by suppressing pro-apoptotic signals allowing survival of injured cells. Thus, carcinogenesis involves cascade of mechanisms of multiple intracellular processes such as alteration of genes and signal transduction pathways. However, it depends on the intensity, location of the oxidative stress, and the predominance of endogenous antioxidant system for manifestation of diseases. The present study attempts to give an account of mechanisms of carcinogenesis in ROS-mediated DNA damage (gene mutation) and epigenetic alterations (DNA methylation and acetylation) in the process of induction and propagation of cancer. Relevance of radioadaptive, inflammation, and apoptosis is described in the process of tumorigenesis and its prevention. Role and mechanisms of antioxidants including polyphenols in prevention of cancer is elucidated. It is pointed out that modification of ROS-mediated damage to vital cellular constituents by natural antioxidants and activation of pro-apoptotic pathways to remove injured cells may offer effective protocol for prevention of cancer. In a normal cell, cellular homeostasis is maintained because of a perfect redox balance between the generation of ROS and neutralization of excess ROS generated by endogenous defense machinery. In a normal cell, ROS are mainly produced in mitochondria during mitochondrial respiratory process. During respiration and adenosine triphosphate synthesis, leakage of electron takes place and oxygen molecules are reduced producing several ROS., A number of environmental stressors and stimulants induce ROS generation inside a cell. However, built-in endogenous defense system (antioxidant enzymes) neutralizes the ROS, and normal cells perform their function uninterrupted. The antioxidant system includes a variety of enzymes, namely, SOD, catalase, enzymes from the thioredoxin system (e.g., thioredoxins, thioredoxin peroxidases, and peroxiredoxins), glutathione system enzymes (includes glutathione, glutathione reductase, peroxidase, and transferase), and vitamins such as E and C. In addition, some metal-binding proteins such as transferrin, albumin, and ferritin and metabolites such as uric acid, bilirubin, and pyruvate play a significant role in neutralizing the excess ROS production.,, The oxidative stress induced damaging species if not neutralized; they attack and cause damage to vital cellular molecules, such as DNA, protein, and lipids (membrane) resulting in the dysfunction and injury to cells. These processes usually comprise a series of molecular events such as redox-sensitive signaling pathways, activation of transcription factors, expression of genes, and other metabolic activities. It is widely accepted that ROS produce aberration and mutagenic effects in a normal cell, but they are also known to play useful roles in regulation of signal transduction pathways and maintain cellular homeostasis by redox-control events. For example, studies have shown that ROS control the signal transduction pathway by targeting some of the key molecules such as mitogen-activated protein kinases (MAPKs), protein phosphatases, and transcription factors (nuclear factor-kappa B [NF-κB] and c-Jun N-terminal kinase [JNK]).,,, Appropriate cellular homeostasis is adjusted and maintained until there is a redox balance in the cell, that is, neutralization of excess ROS by the antioxidants. On the other hand, tumor cells are characterized by altered cytosolic redox balance due to accelerated metabolism and uncontrolled cell division. Studies on the role of ROS in tumor cells have shown abundance of DNA strand breaks, mutations, DNA cross-linking, and activation of proto-oncogenes and tumor-suppressor genes which promote transformation of normal cell to tumor cell., It is commonly recognized that oxidative stress is associated with the three major stages of chronic carcinogenesis process, namely, initiation, promotion, and progression. ROS-induced DNA damage, gene mutations, and structural changes in DNA are the key checkpoints during the cancer initiation stage in cells. Likewise in promotion stage, ROS-mediated processes lead to abnormal gene expression, restrictions in cell communications, and alteration in signal transduction which facilitates the decrease in apoptosis and increase in cell proliferation. In the progression stage of the cancer process, cells continues to harbor further DNA alterations because of enforced oxidative stress. Furthermore, genomic instability induced by ROS-mediated oxidative stress activates certain signaling pathways responsible for tumor development through control of cellular proliferation, angiogenesis, and metastasis. It is amply evident that external stressing agents induced excess production of ROS inside a cell is the primary step which stimulates the mechanism of oncogenesis. It needs further to be noted that ROS produces cellular transformation by altering the redox-regulated signaling pathways emphasizing that redox state of a cell plays a crucial role in signal transduction, proliferation, differentiation, and apoptosis., It is intriguing that, at this point of time, how ROS plays multitude of roles in the tightly regulated functioning and transformation of normal cell to cancer cell. It is important to detect and quantify oxidative stress in cells and tissues for designing strategies for prevention of cancer. Several markers have been identified related to oxidative stress and samples widely range, for example, cells, tissues, urine, and blood. ROS mediated oxidative stress damage vital cellular molecules such as DNA, lipids, proteins etc. Cell membrane is one of the primary targets of oxidative stress. It is composed of lipid bilayer and proteins whose modification increases the risk of cell death through apoptosis or necrosis. Studies from our research group have demonstrated radiooxidative damage to membrane-mediated induction of apoptosis in normal and tumor cells.,, Some other studies reported that polyunsaturated fatty acids, for example, lipid hydroperoxy radicals and lipid hypoperoxides, are formed because of interaction of ROS with the membrane lipids., Proteins are one of the other vital biomolecules which are target for damage due to the redox imbalance state formed due to excess ROS generation inside the cell. Among the modification/damage in the proteins, the most common alterations consist in modification of amino acid sequences, cross linkages between the proteins, and cleavage of peptide bonds. These events damage the essential protein molecules inside the cells which lead to decrease in enzyme activities, alteration in signal transduction mechanisms, and inefficient membrane transport activities., In addition to damage to lipids and proteins, ROS severely damage DNA. It has been reported in literature that ROS produce modification in nitrogenous bases, single-stranded and double-stranded DNA breaks, and cross-links in the DNA., These damages if persist for a longer time cells are driven to carcinogenesis due to induction of signal transduction pathways, arrest and/or induction of transcription, replication errors, and genomic instability. The DNA base alteration or modification occurs mainly by base modification process. These base modifications occur from the addition of the hydroxyl radical to the C8 position of the guanine ring producing a 8-hydroxy-7,8-dihydroguanyl radical and can be oxidized to form 8-oxoGua or reduced to give the ring-opened FapyGua., Likewise, hydroxyl radical reacts with thymine and cytosine at carbon positions 5 or 6 and produces several base lesions which form well-known marker products such as thymine glycol/Tg (5,6-dihydroxy-5,6-dihydrothymine) and cytosine glycol (5,6-dihydroxy-5,6-dihydrocytosine). The cascade of mechanisms reflects in single-strand breaks in the DNA., Furthermore, it is known that simultaneous attack of multiple ROS (high oxidative stress condition) to DNA can cause double-strand break of the DNA. ROS also attack and react with various cellular proteins which mostly participate in DNA repair mechanism and cell cycle control system. These alterations or damages promote mutations and genomic instability resulting in tumorigenesis. 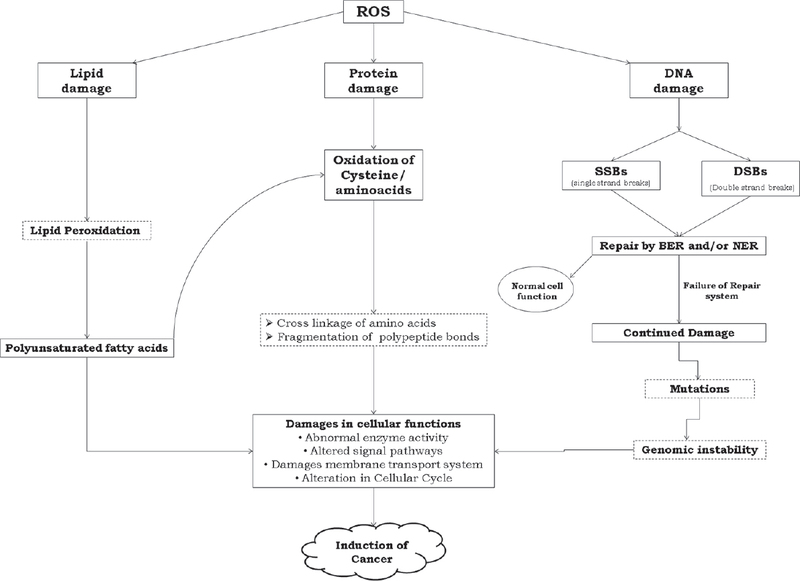 A schematic diagram of the ROS-mediated damages is schematically illustrated in [Figure 1]. Elevated level of ROS beyond a certain limit induces (especially from moderate to high radiation dose exposures) undesirable oxidative damage in the cells. However, apart from injurious and mutagenic effects, ROS is known to be a regulator of a variety of signal transduction function. For example, it works with MAPK, various transcription factors, and protein phosphatases. In the presence of hydrogen peroxide (H2O2), the MAPK pathway activates the RAS. This process needs conversion of Ras-GDP to Ras-GTP which is mediated by oxidation of cysteine residue. In addition, ROS-mediated oxidation of cysteine is known to trigger the phosphatases known to play key signaling functions. Binding of transcription factors to DNA and transcription of gene are well known to regulate redox reactions. Studies have reported existence of mechanisms such as transcription factor activator protein-1 (AP-1) which binds to DNA for upregulation of transcription of genes.,, In addition, transcription factor NF-κB is known to respond to ROS. NF-κB is an important transcription factor mostly involved in the regulation of expression of many genes for inflammatory, immune, and antiapoptotic responses. Thus, NF-κB plays a crucial role in controlling cell survival in response to oxidative stress. Activation of NF-κB depends on the redox balance and some other cellular stimulus. Involvement of ROS in many important signaling pathways predicts associated disease risks due to network alteration and cellular dysfunction in situ ations of redox imbalances. Invariably, ROS-producing agents pose to be a carcinogen and cause mutagenesis, promotion, and progression of cancer.,, Carcinogenesis involves a cascade of altered signal transduction pathways, regulation of transcription factor, and gene expression., ROS is shown to facilitate the proliferation of several types of cancer cells  mediated by MAPK, extracellular signal-regulated kinase (ERK), JNK, and p38., Hypoxia-inducible factor-1 is also known to induce proliferation signals in tumor cells in hypoxic microenvironment. The transcription factors such as NF-κB and AP-1 are commonly associated with the expression of genes such as c-jun and c-fos, which are known to cause inflammatory influx, apoptosis inhibition, proliferation of cell, transformation, and differentiation. It has been demonstrated that continuous inflammation may lead to a preneoplastic situation.,, Chronically inflamed cells secrete a large amount of ROS and reactive nitrogen species and recruit more activated immune cells leading to amplification of dysregulated processes and eventually giving rise to a preneoplasia. In fact, oxidative stress and chronic inflammation processes are tightly coupled processes and the failure to block these processes may result in genetic/epigenetic changes that initiate carcinogenesis. Among others, the epidermal growth factor receptor signaling pathway and key signaling proteins, namely, the nuclear factor erythroid 2-related factor 2 (NRF2), Ras/Raf, the mitogen-activated protein kinases (MAPKs) ERK1/2, and MEK, phosphatidylinositol 3-kinase (PI3K), phospholipase C, and protein kinase C are affected by oxidative stress.,, It is widely accepted that radiation oxidative stress causes changes in gene expression, cell proliferation, and apoptosis and plays a significant role in tumor initiation and progression.,,, At this point, it appears appropriate to state, though it does not fall within the scope of this review, that excess intracellular ROS produced in response to therapies act as cellular toxicants affecting cell growth arrest, apoptosis, or necrosis opening new avenues for improving therapies., It is significant that tissue redox status has diagnostic as well as prognostic potential in cancer therapy, and studies have reported that low antioxidant status and increased oxidative stress levels are commonly found in most cancer patients. Studies from our research group have shown that radiotherapy in combination with several natural antioxidants, flavonoids, and polyphenols increases ROS generation and induces apoptosis in several tumor cell lines, but these studies are deliberately excluded in this paper. Oxidative stress and inflammatory damages play an important role in epigenetic reprogramming of expression of cytokines, oncogenes, and tumor suppressor genes involved in chronic inflammatory diseases and carcinogenesis., On the other hand, global hypomethylation of DNA causes global chromosome instability leading to various mutations and tumor progression., Epigenetic aberrations cause induction of cancer, and therefore, interventional approaches targeting the epigenome offer possibility of investigating deeper aspects of mechanisms involved and interestingly point to a promising therapeutic intervention., Epigenetics concerns heritable changes in gene expression without changes in the DNA sequence and related to interactions between the genome and environment., Traditional epigenetic changes such as DNA methylation and histone modifications are able to affect gene expression mostly by interfering with the accessibility of transcription factors with DNA or may lead to structural rearrangement of chromatin, thus promoting the expression of particular genes. Evidence has accumulated to show that epigenetic alterations can largely contribute to the carcinogenesis and are the hallmark of cancer. The present understanding is that both onset and progression of cancer are driven not only by acquired genetic alterations but also epigenetic modifications of gene expression., In cancer cells, hypermethylation on certain promoter regions of tumor suppressor genes causes gene silencing, thereby blocking the expression of these pivotal genes. In fact, the Food and Drug Administration has approved DNA methyl transferase (DNMT) and histone deacetylase (HDAC) inhibitors as drugs., It is relevant to note that various new DNMT as well as HDAC inhibitors are under development, and a synergistic combination of epigenetic modifying agents, including miRNAs, may provide reversal of epigenomic cancer condition. ROS-induced oxidative stress above the thrash hold limit leads to the cell death mainly by induction of apoptotic cell death (ACD). ACD is known to be triggered through two ways: Extrinsic (i.e., receptor-mediated) or intrinsic (i.e., mitochondria-mediated) pathways which are known to be triggered by ROS. In addition, as mitochondria are the main site of ROS productions, accumulation of ROS is known to induce the cellular apoptosis. Various ROS such as H2O2 are known to activate nuclear transcription factors (NF-κB, AP-1, and p53) that possibly lead to upregulation of death proteins or production of inhibitors of survival proteins leading to apoptosis and cell death.,, Cancer stemness is associated with low level of ROS which indicates an important pathway to prevent and treat cancer by modulation of cellular redox state. Dietary antioxidants have been shown to play an important role in chemoprevention. Many epidemiological studies have concluded that people who eat more vegetables, fruits, and other types of food rich in phenolic antioxidants may have a lower risk of developing some types of cancer. It is well established that the Mediterranean dietary pattern has beneficial effects on the prevention of cancer incidence and mortality. The Mediterranean diet is characterized by high antioxidant content capable of affecting inflammatory progress, cell cycle, proliferation and apoptosis process, and gene expression modulation., In the standard anticancer treatment options such as surgery and chemo-/radio-therapy, several natural polyphenols have been identified as having potential for cancer prevention as well as in treatment. Polyphenols are the most abundant antioxidants in the diet and are widespread constituents of fruits, vegetables, cereals, dry legumes, chocolate, and beverages, such as tea, coffee, or wine. Experimental studies on animals or cultured human cell lines support a role of polyphenols in the prevention of cardiovascular diseases, cancers, neurodegenerative diseases, diabetes, or osteoporosis. However, it is uncertain if these results of polyphenol intake affect disease prevention in humans. Studies from many researchers and that from our research group have investigated preventive and therapeutic properties of flavonoids and polyphenols for their antioxidant properties. Evidence has accumulated to show that apart from their antioxidant ability to prevent damage caused by oxidative stress, polyphenols exert some of their biological effects through chromatin remodeling and other epigenetic modifications  such as activation or silencing of genes. Many polyphenols are reported to regulate NF-κB expression and chromatin remodeling through either activation or inhibition of epigenetic-related enzymes. Dietary polyphenols, such as epigallocatechin-3-gallate, genistein, lycopene, curcumin, and resveratrol, block DNA methylation by modulating DNA methyltransferase activity. Studies on a wide spectrum of various bioactive polyphenols that regulate multiple cancer-inflammation pathways and epigenetic cofactors exhibit low toxicity and are readily available. The role of polyphenols in regulation of epigenetic process including sirtuin 1 (SIRT1) modulation has been reported., Sirtuins are a subclass of HDACs that can modify metabolism, inflammation, aging, or cellular apoptosis in many pathological processes. Sulforaphane is a bioactive polyphenol present in cruciferous vegetables such as broccoli and cabbage, which is shown to induce expression of phase-II detoxification enzymes  and expression of glutathione transferase in murine hepatocytes. It is the need of the hour to identify drugs that can be effective in killing of the cancerous cell inside the cell. Apart from the other available mechanisms, targeting the apoptosis inducer in tumor cells seems promising. Therefore, a cellular mechanism is needed to increase the endogenous ROS threshold level inside the tumor cells and this is very crucial. The endogenous ROS threshold builds enhanced oxidative stress in the cell which then leads to apoptosis through initiating a cascade of signaling pathways. At the same time, it is also essential to note that the ROS-induced enhanced oxidative stress must have to applicable selectively to the cancer cells sparing the normal cells. To achieve this mechanism of sensitizing the tumor cell, herbal-based antioxidants are seemed promising.,,, The herbals extracts hold the promise because of their easy acceptability and accessibility, comparatively less toxic (at higher concentration), reduced side effects, and economical. The mechanism of action of antioxidants works by recognition of cytosolic redox balance status within a cell that distinguishes between the normal and stressed cell. Moreover, it is clearly known that the redox status of the normal cell is different from the cancer cell (stressed cell). Various research groups have extensively studied potential of several compounds from plant kingdom at cell, cell line, and animal level of cancer research to improve the selectively killing of cancer cells. The current research demand is to increase the stressed condition of the cancer cells by inducing ROS from outside sources to a sufficient level that the built-in defense mechanism of cell will fail to tolerate the excess of ROS and oxidative stress. Thus, the cancer cell death will occur following the apoptotic pathway. Our research group has demonstrated that several experiments were plant extracts such as biochanin A, eugenol, and ellagic acid which play a vital role in selectively killing of cancer cells in radiotherapy.,,, Furthermore, studies have reported that Indian medicinal composition named “Triphala” is a potential effective anticancer drug that works by selectively increasing ROS level in tumor cells and inducing apoptosis in cancer cells while sparing the normal cells.,, It was reported that in normal cell, Triphala scavenges the ROS  and also prevents the DNA damage, reduces activity of xanthine oxidase, and increases SOD activity leading to the lower level of ROS in normal cells.Nigella sativa is yet another herbal plant commonly known as black cumin in Indian and Asian dietary additive which also promises ROS-mediated cytotoxicity in cancer cells and protection to the cancer cell., The research findings suggest that herbs, medicinal plants, and their bioactive compounds (antioxidants) show immense potential to neutralize the adverse effects and cellular abnormalities caused by ROS. Some of these active compound were reported to be effective in inhibiting MMPS, NF-κB translocation, and lipid peroxidation. It appears that antioxidants upregulate endogenous defense machinery of normal cell toward harmful effects of ROS so preventing the carcinogenesis and at the same time may cause cell death to the cancer cell. In general, antioxidants exhibit the protection from ROS by electron donation, metal ion chelation, co-antioxidants, or regulation gene expression.,,,,, Antioxidants are also known to affect apoptosis by inhibiting proteins in the apoptotic cascade or modification of gene expressions. In addition, herbal antioxidants are reported to modify cell survival and DNA repair efficacy by downregulating activation of receptor tyrosine kinases and NF-κB. Radiation produces oxidative stress in living mammalian cells by generating ROS. Precancer cells have marginally increased rate of ROS production compared to normal cells, and they are gradually driven to increased level of ROS causing imbalanced cytosolic redox status leading to cancer. Optimally functional steady state intracellular ROS in normal cells are known to regulate cellular signaling mechanisms and ensure healthy cell survival. More than normal ROS levels are implicated in the process of initiating, promoting, and maintaining tumorigenicity by altering signaling network. It is suggestive that cells respond to ionizing radiation in graded level of oxidative stress shown in stimulation (low ROS level), functional aberration (moderate ROS level), and death program (severe/detrimental ROS level). The role of endogenous and dietary antioxidants in prevention of cancer is identified. Recent focus of research is directed to study the role of antioxidants including natural polyphenols on modulating intracellular ROS levels leading to epigenetic modifications of pivotal genes in tumorigenesis. Several polyphenols have been demonstrated to interfere with enzymes driving the epigenetic alterations relevant to modulate inflammation process in determining the course of cancer induction. It needs important to focus on research on ROS mechanisms in genetic and epigenetic alterations such as gene mutation, cell proliferation, signal transduction, apoptosis, transcriptional factors, and modulating them by specific antioxidants from vast natural phenolic sources. Epidemiological and experimental data support the bright future of natural polyphenols as chemopreventive and anticancer drugs., The complex balance of cell proliferation, apoptosis, and senescence induced by polyphenols appear promising to develop new preventive and treatment strategies for cancer., Intensive research is warranted to target the signaling pathways to induce the apoptosis in precancerous and cancer cell. However, the mechanisms of exogenous and endogenous antioxidants in free radical neutralization, DNA damage repair, and epigenetic reversals are important to delineate. It is becoming clear that targeting the cellular moiety controlling the gene mutation, signal transduction pathways, and epigenetic transcription factors is important in cancer induction and prevention. Research on radiation-induced intracellular ROS generation and their involvement in regulation of proliferation and apoptosis of tumor cells may unravel some key factors necessary in designing strategies for prevention and treatment of cancer. Cellular sensitivity to low, moderate, and high doses of radiation needs to be graded and categorized. Mechanisms of antioxidants in chemoprevention seem more than simply neutralizing the ROS, and future research may reveal hitherto unknown pathways in the mechanisms of cancer prevention. Lessons have to be taken from epidemiological and experimental results which suggest preventive roles of dietary antioxidants, especially from fruits and vegetables. The observed lower ROS in cancer stem cells and associated resistance to chemo-/radio-therapy stimulate a novel direction to modulate stem cells through development of specific inducers of ROS persuading precancerous and stem cells to follow apoptotic death. It would be highly warranted to develop new strategies based on identifying agents able to directly target quiescent cancer stem cells. Since low ROS levels have been suggested to be critical for maintaining cellular stemness, an increase of these reactive species by natural polyphenols may sensitize cancer stem cells to therapy. The future of polyphenol-epigenomic therapy has several challenges ahead, and it is a promising field for clinical cancer interventions. An important area of future research would be to develop biomarkers for redox status of precancer cells which presently poses a major challenge for diagnosis and prevention of cancer. Manda G, Nechifor MT, Neagu TM. Reactive oxygen species, cancer and anti-cancer therapy. Curr Chem Biol 2009;3:342-66. Davies KJ. Protein damage and degradation by oxygen radicals. I. general aspects. J Biol Chem 1987;262:9895-901. Dalle-Donne I, Rossi R, Colombo R, Giustarini D, Milzani A. Biomarkers of oxidative damage in human disease. Clin Chem 2006;52:601-23. Packer L, Cadenas E. Oxidants and antioxidants revisited. New concepts of oxidative stress. Free Radic Res 2007;41:951-2. Dalle-Donne I, Scaloni A, Giustarini D, Cavarra E, Tell G, Lungarella G, et al. Proteins as biomarkers of oxidative/nitrosative stress in diseases: The contribution of redox proteomics. Mass Spectrom Rev 2005;24:55-99. Brown NS, Bicknell R. Hypoxia and oxidative stress in breast cancer. Oxidative stress: Its effects on the growth, metastatic potential and response to therapy of breast cancer. Breast Cancer Res 2001;3:323-7. Calvisi DF, Ladu S, Hironaka K, Factor VM, Thorgeirsson SS. Vitamin E down-modulates iNOS and NADPH oxidase in c-Myc/TGF-alpha transgenic mouse model of liver cancer. J Hepatol 2004;41:815-22. Oliveira CP, Kassab P, Lopasso FP, Souza HP, Janiszewski M, Laurindo FR, et al. Protective effect of ascorbic acid in experimental gastric cancer: Reduction of oxidative stress. World J Gastroenterol 2003;9:446-8. Azad N, Rojanasakul Y, Vallyathan V. Inflammation and lung cancer: Roles of reactive oxygen/nitrogen species. J Toxicol Environ Health B Crit Rev 2008;11:1-15. Su Z, Yang Z, Xu Y, Chen Y, Yu Q. Apoptosis, autophagy, necrotopsis, and cancer metastasis. Molecular Cancer 2015; 14:48 DOI: 10.1186/s12943-015-0321-5. Bilodeau JF, Blanchette S, Cormier N, Sirard MA. Reactive oxygen species-mediated loss of sperm motility in egg yolk Tris extender: Protection by pyruvate, metal chelators and bovine liver or oviductal fluid catalase. Thriogenology 2002; 57:1105-22. Spitz DR, Azzam EI, Li JJ, Gius D. Metabolic oxidation/reduction reactions and cellular responses to ionizing radiation: A unifying concept in stress response biology. Cancer Metastasis Rev 2004;23:311-22. Martinez GR, Loureiro AP, Marques SA, Miyamoto S, Yamaguchi LF, Onuki J, et al. Oxidative and alkylating damage in DNA. Mutat Res 2003;544:115-27. Linnane AW, Eastwood H. Cellular redox regulation and prooxidant signaling systems: A new perspective on the free radical theory of aging. Ann N Y Acad Sci 2006;1067:47-55. Chiarugi P, Cirri P. Redox regulation of protein tyrosine phosphatases during receptor tyrosine kinase signal transduction. Trends Biochem Sci 2003;28:509-14. Green DR. Death and NF-kappaB in T cell activation: Life at the edge. Mol Cell 2003;11:551-2. Torres M, Forman HJ. Redox signaling and the MAP kinase pathways. Biofactors 2003;17:287-96. Hussain SP, Hofseth LJ, Harris CC. Radical causes of cancer. Nat Rev Cancer 2003;3:276-85. Meira LB, Bugni JM, Green SL, Lee CW, Pang B, Borenshtein D, et al. DNA damage induced by chronic inflammation contributes to colon carcinogenesis in mice. J Clin Invest 2008;118:2516-25. Klaunig JE, Xu Y, Isenberg JS, Bachowski S, Kolaja KL, Jiang J, et al. The role of oxidative stress in chemical carcinogenesis. Environ Health Perspect 1998;106 Suppl 1:289-95. Chandra J, Samali A, Orrenius S. Triggering and modulation of apoptosis by oxidative stress. Free Radic Biol Med 2000;29:323-33. Cai F, Dupertuis YM, Pichard C. Role of polyunsaturated fatty acids and lipid peroxidation on colorectal cancer risk and treatments. Curr Opin Clin Nutr Metab Care 2012;15:99-106. Alvarez JG, Aitken RJ. Lipid peroxidation in human spermatozoa. Studies on Men's Health and Fertility. Humana Press, New York, USA 2012. p. 119-30. Stadtman ER. Role of oxidant species in aging. Curr Med Chem 2004;11:1105-12. Ott M, Gogvadze V, Orrenius S, Zhivotovsky B. Mitochondria, oxidative stress and cell death. Apoptosis 2007;12:913-22. Ogasawara MA, Zhang H. Redox regulation and its emerging roles in stem cells and stem-like cancer cells. Antioxid Redox Signal 2009;11:1107-22. Altieri F, Grillo C, Maceroni M, Chichiarelli S. DNA damage and repair: From molecular mechanisms to health implications. Antioxid Redox Signal 2008;10:891-937. Jiranusornkul S, Laughton CA. Destabilization of DNA duplexes by oxidative damage at guanine: Implications for lesion recognition and repair. J R Soc Interface 2008;5 Suppl 3:S191-8. Dedon PC. The chemical toxicology of 2-deoxyribose oxidation in DNA. Chem Res Toxicol 2008;21:206-19. Chan W, Chen B, Wang L, Taghizadeh K, Demott MS, Dedon PC. Quantification of the 2-deoxyribonolactone and nucleoside 5'-aldehyde products of 2-deoxyribose oxidation in DNA and cells by isotope-dilution gas chromatography mass spectrometry: Differential effects of gamma-radiation and Fe2 -EDTA. J Am Chem Soc 2010;132:6145-53. Georgakilas AG. Processing of DNA damage clusters in human cells: Current status of knowledge. Mol Biosyst 2008;4:30-5. Gillard N, Begusova M, Castaing B, Spotheim-Maurizot M. Radiation affects binding of Fpg repair protein to an abasic site containing DNA. Radiat Res 2004;162:566-71. Lander HM, Tauras JM, Ogiste JS, Hori O, Moss RA, Schmidt AM. Activation of the receptor for advanced glycation end products triggers a p21(ras)-dependent mitogen-activated protein kinase pathway regulated by oxidant stress. J Biol Chem 1997;272:17810-4. Hess J, Angel P, Schorpp-Kistner M. AP-1 subunits: Quarrel and harmony among siblings. J Cell Sci 2004;117(Pt 25):5965-73. Abate C, Patel L, Rauscher FJ 3rd, Curran T. Redox regulation of fos and jun DNA-binding activity in vitro. Science 1990;249:1157-61. Thannickal VJ, Fanburg BL. Reactive oxygen species in cell signaling. Am J Physiol Lung Cell Mol Physiol 2000;279:L1005-28. Retèl J, Hoebee B, Braun JE, Lutgerink JT, van den Akker E, Wanamarta AH, et al. Mutational specificity of oxidative DNA damage. Mutat Res 1993;299:165-82. Filomeni G, Rotilio G, Ciriolo MR. Disulfide relays and phosphorylative cascades: Partners in redox-mediated signaling pathways. Cell Death Differ 2005;12:1555-63. Davis RJ. Signal transduction by the JNK group of MAP kinases. Cell 2000;103:239-52. Bours V, Bentires-Alj M, Hellin AC, Viatour P, Robe P, Delhalle S, et al. Nuclear factor-kappa B, cancer, and apoptosis. Biochem Pharmacol 2000;60:1085-9. Guina T, Biasi F, Calfapietra S, Nano M, Poli G. Inflammatory and redox reactions in colorectal carcinogenesis. Ann N Y Acad Sci 2015;1340:95-103. Thapa D, Ghosh R. Chronic inflammatory mediators enhance prostate cancer development and progression. Biochem Pharmacol 2015;94:53-62. Beaugerie L. Management of inflammatory bowel disease patients with a cancer history. Curr Drug Targets 2014;15:1042-8. Klaunig JE, Kamendulis LM, Hocevar BA. Oxidative stress and oxidative damage in carcinogenesis. Toxicol Pathol 2010;38:96-109. Huo L, Li CW, Huang TH, Lam YC, Xia W, Tu C, et al. Activation of Keap1/Nrf2 signaling pathway by nuclear epidermal growth factor receptor in cancer cells. Am J Transl Res 2014;6:649-63. Korbecki J, Baranowska-Bosiacka I, Gutowska I, Chlubek D. The effect of reactive oxygen species on the synthesis of prostanoids from arachidonic acid. J Physiol Pharmacol 2013;64:409-21. Matsuzawa A, Ichijo H. Redox control of cell fate by MAP kinase: Physiological roles of ASK1-MAP kinase pathway in stress signaling. Biochim Biophys Acta 2008;1780:1325-36. Nguyen A, Chang AC, Reddel RR. Stanniocalcin-1 acts in a negative feedback loop in the prosurvival ERK1/2 signaling pathway during oxidative stress. Oncogene 2009;28:1982-92. Wiemer EA. Stressed tumor cell, chemosensitized cancer. Nat Med 2011;17:1552-4. Gorrini C, Harris IS, Mak TW. Modulation of oxidative stress as an anticancer strategy. Nat Rev Drug Discov 2013;12:931-47. Trachootham D, Lu W, Ogasawara MA, Nilsa RD, Huang P. Redox regulation of cell survival. Antioxid Redox Signal 2008;10:1343-74. Ivanova D, Bakalova R, Lazarova D, Gadjeva V, Zhelev Z. The impact of reactive oxygen species on anticancer therapeutic strategies. Adv Clin Exp Med 2013;22:899-908. Hansen KD, Timp W, Bravo HC, Sabunciyan S, Langmead B, McDonald OG, et al. Increased methylation variation in epigenetic domains across cancer types. Nat Genet 2011;43:768-75. Olzscha H, Sheikh S, La Thangue NB. Deacetylation of chromatin and gene expression regulation: A new target for epigenetic therapy. Crit Rev Oncog 2015;20:1-17. Bird A. Perceptions of epigenetics. Nature 2007;447:396-8. Sandoval J, Esteller M. Cancer epigenomics: Beyond genomics. Curr Opin Genet Dev 2012;22:50-5. Choi JD, Lee JS. Interplay between epigenetics and genetics in cancer. Genomics Inform 2013;11:164-73. Kulis M, Esteller M. DNA methylation and cancer. Adv Genet 2010;70:27-56. Lopez-Pastrana J, Shao Y, Chernaya V, Wang H, Yang XF. Epigenetic enzymes are the therapeutic targets for CD4(+) CD25(+/high)Foxp3(+) regulatory T cells. Transl Res 2015;165:221-40. Mummaneni P, Shord SS. Epigenetics and oncology. Pharmacotherapy 2014;34:495-505. Hamm CA, Costa FF. Epigenomes as therapeutic targets. Pharmacol Ther 2015;151:72-86. Kontou N, Psaltopoulou T, Panagiotakos D, Dimopoulos MA, Linos A. The mediterranean diet in cancer prevention: A review. J Med Food 2011;14:1065-78. Russo MA, Sansone L, Polletta L, Runci A, Rashid MM, De Santis E, et al. Sirtuins and resveratrol-derived compounds: A model for understanding the beneficial effects of the Mediterranean diet. Endocr Metab Immune Disord Drug Targets 2014;14:300-8. Fantini M, Benvenuto M, Masuelli L, Frajese GV, Tresoldi I, Modesti A, et al. In vitro and in vivo antitumoral effects of combinations of polyphenols, or polyphenols and anticancer drugs: Perspectives on cancer treatment. Int J Mol Sci 2015;16:9236-82. Rahman I, Chung S. Dietary polyphenols, deacetylases and chromatin remodeling in inflammation. J Nutrigenet Nutrigenomics 2010;3:220-30. Yang P, He X, Malhotra A. Epigenetic targets of polyphenols in cancer. J Environ Pathol Toxicol Oncol 2014;33:159-65. Gerhauser C. Cancer chemoprevention and nutriepigenetics: State of the art and future challenges. Top Curr Chem 2013;329:73-132. Vanden Berghe W. Epigenetic impact of dietary polyphenols in cancer chemoprevention: Lifelong remodeling of our epigenomes. Pharmacol Res 2012;65:565-76. Rahman I, Marwick J, Kirkham P. Redox modulation of chromatin remodeling: Impact on histone acetylation and deacetylation, NF-kappaB and pro-inflammatory gene expression. Biochem Pharmacol 2004;68:1255-67. Ayissi VB, Ebrahimi A, Schluesenner H. Epigenetic effects of natural polyphenols: A focus on SIRT1-mediated mechanisms. Mol Nutr Food Res 2014;58:22-32. Sasaki K, Neyazaki M, Shindo K, Ogawa T, Momose M. Quantitative profiling of glucosinolates by LC-MS analysis reveals several cultivars of cabbage and kale as promising sources of sulforaphane. J Chromatogr B Analyt Technol Biomed Life Sci 2012;903:171-6. Zhang Y, Talalay P, Cho CG, Posner GH. A major inducer of anticarcinogenic protective enzymes from broccoli: Isolation and elucidation of structure. Proc Natl Acad Sci U S A 1992;89:2399-403. Posner GH, Cho CG, Green JV, Zhang Y, Talalay P. Design and synthesis of bifunctional isothiocyanate analogs of sulforaphane: Correlation between structure and potency as inducers of anticarcinogenic detoxication enzymes. J Med Chem 1994;37:170-6. Gottlieb E, Vander Heiden MG, Thompson CB. Bcl-x(L) prevents the initial decrease in mitochondrial membrane potential and subsequent reactive oxygen species production during tumor necrosis factor alpha-induced apoptosis. Mol Cell Biol 2000;20:5680-9. Price R, van Vugt M, Nosten F, Luxemburger C, Brockman A, Phaipun L, et al. Artesunate versus artemether for the treatment of recrudescent multidrug-resistant falciparum malaria. Am J Trop Med Hyg 1998;59:883-8. Lowe SW, Ruley HE, Jacks T, Housman DE. p53-dependent apoptosis modulates the cytotoxicity of anticancer agents. Cell 1993;74:957-67. Meher PK, Sharma P, Mishra KP. Herbal based strategy for radioprotection against radiation exposure. In: Radiation Exposure: Monitoring Systems, Long-Term Health Effects and Methods for Protection. New York, USA: Nova Science Publishers; 2015. p. 165-74. Dayal R, Singh A, Pandey A, Mishra KP. Reactive oxygen species as mediator of tumor radiosensitivity. J Cancer Res Ther 2014;10:811-8. Dayal R, Singh A, Mishra KP. Role of antioxidants in cellular response to ionizing radiation. In: Radiation Exposure: Monitoring Systems, Long-Term Health Effects and Methods for Protection. New York, USA: Nova Science Publishers;2015. p. 175-92. Sandhya T, Lathika KM, Pandey BN, Bhilwade HN, Chaubey RC, Priyadarsini KI, et al. Protection against radiation oxidative damage in mice by Triphala. Mutat Res 2006;609:17-25. Puthli A, Tiwari R, Mishra KP. Biochanin A enhances the radiotoxicity in colon tumor cells in vitro. J Environ Pathol Toxicol Oncol 2013;32:189-203. Girdhani S, Bhosle SM, Thulsidas SA, Kumar A, Mishra KP. Potential of radiosensitizing agents in cancer chemo-radiotherapy. J Cancer Res Ther 2005;1:129-31. Sandhya T, Lathika KM, Pandey BN, Mishra KP. Potential of traditional ayurvedic formulation, Triphala, as a novel anticancer drug. Cancer Lett 2006;231:206-14. Sandhya T, Mishra KP. Cytotoxic response of breast cancer cell lines, MCF 7 and T 47 D to triphala and its modification by antioxidants. Cancer Lett 2006;238:304-13. Jagetia GC, Baliga MS, Malagi KJ, Sethukumar Kamath M. The evaluation of the radioprotective effect of Triphala (an ayurvedic rejuvenating drug) in the mice exposed to gamma-radiation. Phytomedicine 2002;9:99-108. Jagetia GC, Venkatesh P, Baliga MS. Fruit extract of Aegle marmelos protects mice against radiation-induced lethality. Integr Cancer Ther 2004;3:323-32. Rastogi L, Feroz S, Pandey BN, Jagtap A, Mishra KP. Protection against radiation-induced oxidative damage by an ethanolic extract of Nigella sativa L. Int J Radiat Biol 2010;86:719-31. Velho-Pereira R, Kumar A, Pandey BN, Mishra KP, Jagtap AG. Radioprotection by macerated extract of Nigella sativa in normal tissues of fibrosarcoma bearing mice. Indian J Pharm Sci 2012;74:403-14. Kondo H, Park SH, Watanabe K, Yamamoto Y, Akashi M. Polyphenol (−)-epigallocatechin gallate inhibits apoptosis induced by irradiation in human HaCaT keratinocytes. Biochem Biophys Res Commun 2004;316:59-64. Kurfurstova D, Bartkova J, Vrtel R, Mickova A, Burdova A, Majera D, et al. DNA damage signalling barrier, oxidative stress and treatment-relevant DNA repair factor alterations during progression of human prostate cancer. Mol Oncol 2016;10:879-94. Hecht F, Pessoa CF, Gentile LB, Rosenthal D, Carvalho DP, Fortunato RS. The role of oxidative stress on breast cancer development and therapy. Tumour Biol 2016;37:4281-91. Tu P, Huang Q, Ou Y, Du X, Li K, Tao Y, et al. Aloe-emodin-mediated photodynamic therapy induces autophagy and apoptosis in human osteosarcoma cell line MG-63 through the ROS/JNK signaling pathway. Oncol Rep 2016;35:3209-15. Peiris-Pagès M, Martinez-Outschoorn UE, Sotgia F, Lisanti MP. Metastasis and oxidative stress: Are antioxidants a metabolic driver of progression? Cell Metab 2015;22:956-8. Jeurnink SM, Ros MM, Leenders M, van Duijnhoven FJ, Siersema PD, Jansen EH, et al. Plasma carotenoids, Vitamin C, retinol and tocopherols levels and pancreatic cancer risk within the European Prospective Investigation into Cancer and Nutrition: A nested case-control study: Plasma micronutrients and pancreatic cancer risk. Int J Cancer 2015;136:E665-76. Shu L, Cheung KL, Khor TO, Chen C, Kong AN. Phytochemicals: Cancer chemoprevention and suppression of tumor onset and metastasis. Cancer Metastasis Rev 2010;29:483-502. Mileo AM, Miccadei S. Polyphenols as modulator of oxidative stress in cancer disease: New therapeutic strategies. Oxid Med Cell Longev 2016;2016:6475624. Pandey BN, Sarma HD, Shukla D, Mishra KP. Low-dose radiation induced modification of ROS and apoptosis in thymocytes of whole body irradiated mice. Int J Low Radiat 2006;2:111-8. Mishra KP. Cell membrane oxidative damage induced by gamma-radiation and apoptotic sensitivity. J Environ Pathol Toxicol Oncol 2004;23:61-6. Pandey BN, Mishra KP. Modification of thymocytes membrane radiooxidative damage and apoptosis by eugenol. J Environ Pathol Toxicol Oncol 2004;23:117-22.